Will Google demote highly-trusted content that's not mobile friendly, replacing it with less-trusted content that looks good on a smartphone? Tomorrow is the so-called “mobilegeddon” — the day Google gives mobile-friendly web pages a boost in its mobile search results, and demotes the ones that aren’t. Google gave site owners and webmasters a two-month warning about this change — time enough for many to adapt, but you can bet that many websites are going to disappear from Google’s mobile search results tomorrow. But other small/local businesses may find themselves replaced by bigger competitors — national chains with the money and resources to have adapted already to tomorrow’s mobilegeddon. Google has said this update won’t impact the “local pack” results (see our Mobilegeddon FAQ for more), but Google’s local listings are hardly the only driver of traffic to local business websites. A real estate agent with great neighborhood blog posts or web pages will never find those pages in a local pack, but they do show up in regular mobile search results — and now they have to be mobile friendly. There are also countless non-business websites that will lose mobility visibility because of tomorrow’s change — sites dedicated to favorite athletes, sports teams, TV shows, movies and actors. Or, in my case, a favorite band. Twenty years ago this October, I put my first website online — a website dedicated to U2 and a couple other bands I liked at the time. The website quickly became solely about U2, grew to become known by U2 fans around the world and built up the kind of trust and authority (especially in Google) that most businesses would dream of. The site has ranked in the top three of Google’s search results for the band’s name since Google first started serving search results. In a couple days, it’s probably going to disappear from Google’s mobile search results because it’s not “mobile friendly” in Google’s eyes. I’m not complaining about this; I’ve never considered Google traffic to be something I have a right to. I’m writing about it and sharing this with you because I think my site is an interesting case study. Which is more important: highly-trusted content or mobile-friendly content? I’ll talk more about that question in a moment; first, a little background to get us all on the same page. My website, @U2, launched in October 1995, a couple years before Google.com existed. In 1998, I registered a domain — atu2.com — and have been building content there ever since. We have about three dozen fans around the world working on the site. We produce tons of original news content, what I think are the most accurate U2 lyrics on the web (certainly much better than those awful mega-lyrics sites), a database of every concert U2 has ever played (and the setlists) and much more. We’ve partnered on multiple U2 fan events with the Rock and Roll Hall of Fame and Museum and been honored by Rolling Stone, Entertainment Weekly, Hot Press magazine and many others. Many major music news outlets track us and rely on our reporting in their own U2 coverage. All of that is not to brag, but to explain the level of SEO trust and authority that @U2 has developed over the years, particularly with Google. Today, we’re doing great in Google’s mobile search results. Much like on the desktop, if you search “U2” on your smartphone, we’re the third-listed domain after U2.com and Wikipedia — and there are a bunch of Google universal results mixed in, like upcoming concert dates and the Knowledge Graph cards. As you can see below, Google indicates that Wikipedia is mobile friendly … and we’re not. This is a highly-competitive term and on mobile, we currently hold down the top three spots. None are marked as mobile friendly. “Every Breaking Wave” is the name of U2’s most recent single, and we do pretty well when people are looking for its lyrics. We’re No. 4 behind the official site and two of the mega-lyric sites. This is a term that we own on both the desktop and mobile. 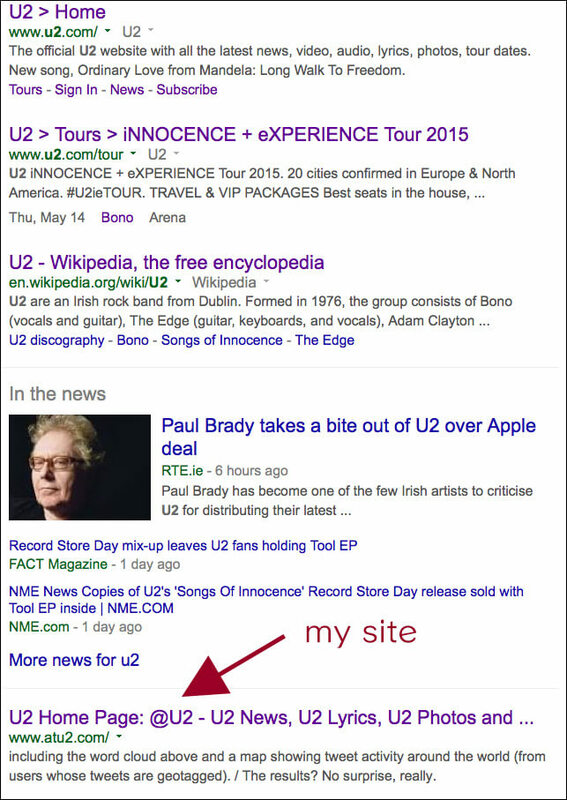 If you’re looking for “u2 news,” we’ll be the first two organic search results on your smartphone after some recent headlines from Google News. We’re ahead of the official site on this query. That’s a sample of some of the primary terms that @U2 ranks well for today on both desktop and mobile. There are many, many more (try “u2 wedding songs” or “u2 love songs,” for example). We get a lot of traffic from Google. Mobile is important to @U2, as it is to just about every website, but the reality is that our mobile traffic has already been declining … likely because our site isn’t mobile friendly. The chart below shows mobile visits in Google Analytics, and I’m using U2’s last two album releases as my comparison point because traffic always spikes when the band is active. In March 2009, when No Line On The Horizon was released, we had 841,000 mobile visits. In September 2014, when Songs Of Innocence was released with all the extra media attention of the Apple event, we had only 620,000 mobile visits. What you’re seeing there is that, in 2014 when there were way more smartphones in use, and when U2’s album release had the enormous attention of that Apple event, we received 26 percent fewer mobile visits than when U2 put out an album in 2009. Even though the mobile-friendly update hasn’t hit yet, we’re already feeling the pain of not having a mobile-friendly website. In short, we’re in the market for a web designer that can take our existing design and make it mobile-friendly … or, better yet, work with us on a new design that’s mobile-friendly. The site has thousands of URLs, many of which are raw HTML. There are numerous databases powering the site — news, lyrics, concert dates, etc. — but it’s all in a proprietary database language developed by the local company where I used to work. We don’t have the luxury of just switching to a new WordPress theme; we need to build from scratch and work within a unique framework. Not long ago, I had the privilege of talking to some Google employees about this situation. We were trading questions and answers about SEO and webmaster issues, and the subject of mobile search came up. More specifically, we talked about the importance of having mobile-friendly websites and how Google has been pushing toward using mobile as a ranking factor. I mentioned that there are millions of small business websites that aren’t mobile friendly, and may never be, and suggested that they keep that in mind so that national chains with local, mobile-friendly web pages don’t take over the search results completely. That I have a 20-year-old website that’s updated almost daily, and has all kinds of trust and authority earned over the years. That Google loves the site, as evidenced by the fact that we outrank the official site on many search terms and are the only unofficial site in the top 10 for the band’s name. That we don’t have a design volunteer on board and don’t have a ton of money to hire someone to make the site mobile friendly. I asked the Google engineers how they think they’d handle my website: Is mobile friendly more important than trusted content? Would they put less-trusted pages that are mobile friendly ahead of @U2 in mobile search results? Or is it better to show searchers the most trusted content, even if it’s not mobile friendly? The Googlers didn’t give a specific reply, but I think I know the answer to my questions. I think @U2 is about to get zapped by mobilegeddon. I’ll be watching our mobile traffic metrics very closely to see how bad it gets. Google systems have tested 4,670 pages from your site and found that 100% of them have critical mobile usability errors. The errors on these 4,670 pages severely affect how mobile users are able to experience your website. These pages will not be seen as mobile-friendly by Google Search, and will therefore be displayed and ranked appropriately for smartphone users. 2.) If @U2 does get zapped by this update, it’s not the end of the world. As I said above, it’s a hobby site and makes no money. If all our Google mobile traffic disappears tomorrow, it has no impact on my ability to pay the bills, support my family, etc. But I’m happy to share my site as a case study for Search Engine Land readers because I think it’s an interesting question that Google faces: What to do with trusted, relevant content that’s not mobile friendly?